Airsoft fully licensed by STI international Airsoft. 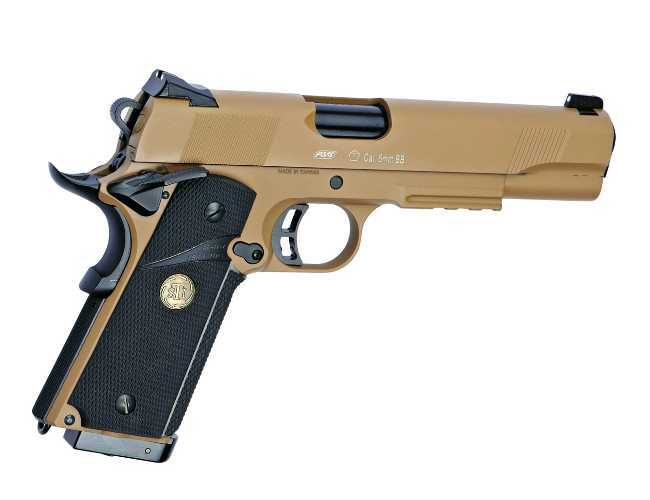 This STI Tactical X comes with a metal slide and body frame with a polymer grip. This gun was designed by Mr Koba of Japan. Chrome barrel and steel guide rod, which along with the dot design trigger and hammer creates a lovely looking gun.This is a fully functioning Airsoft replica handgun comes with an ambidextrous safety, three dot sights and a good Kick back..A CO2 magazine (ref. 17403) can be used with this gun and accessory rail for attachments pistol in desert. Metal frame and polymer grip.